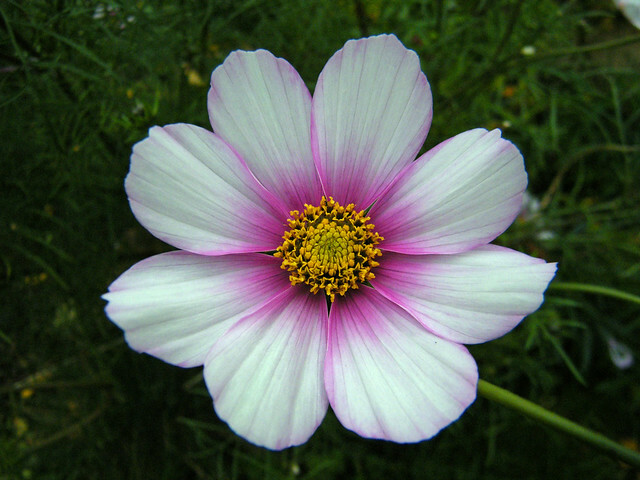 In all my soul-searching about how to get more flowers in the garden in late autumn for my daughter’s birthday, it never occurred to me that half hardy annuals like the cosmos daisies could be a star performer. I planted the entire pack of free seeds from my Gardens Illustrated magazine earlier this year, and that gave me about 30 strong plants. They are stunning! Despite three frosty mornings, they’re powering ahead, and I’m not sure whether that’s due in part to my zero-tolerance policy this year on deadheading. Or rather, live heading – I cut the first flower spike off every plant, which encouraged the cosmos to throw out sideshoot upon sideshoot. If you love cut flowers for the house, you may want to try this next year. This is a power tip that I picked up from Lisa Ziegler, who runs a cut flower nursery in Virginia in US. She was on my favourite gardening podcast earlier in the year, HearSay with Cathy Lewis and Jim Orband “In the Garden.” Lisa’s advice to count up four sets of leaves from the soil and cut off the flower there has proved an absolute winner for me, and given enough cut flowers for every room in the house! I’ve done a short video to show you how many flowers I got from one of my plants in the garden. What do you think? Leave me a comment & let me know. Apologies that the video is somewhat truncated at the very end – I had to edit out the audio from my husband, who at that moment came into the garden and shouted, “Where is the dead bird?” I won’t go into detail — suffice to say it involved our cat, my squeamishness, and the division of labour in our house. Oh, how I wish I had known about this tip earlier in the season. I love cosmos. They are like a workhorse — and they really don’t mind lack of water. Your process sounds like it would keep them more in line, rather than becoming tree-like. Thanks for the tip. I love your video advice – yes I have tried this and also late sowing of hardy annuals- Corn Cockles especially these are still in flower in north Lancashire today -12 November! Mind you it has been a mild autumn here. Do you have any tips on getting cosmos to germinate? I have tried and failed for three springs in Aberdeen. I adore them. Thanks Nitty Gritty! Sorry it’s taken me days to get back to you – I’ve been spending any minutes of spare time trying to replant a border. It kills me to take out a few of the cosmos, but needs must. A few of mine still became treelike despite the nipping out, but there’s no doubt they benefited from the snip. Mary – can you believe what a warm autumn we are having? It was 13° here today. I’m hoping it will help me get some of my replanted perennials establish, now that I’ve done a huge overhaul on one of my small but most noticeable borders. Christine — Are you planting yours inside or direct sowing outside? I started my cosmos with bottom heat, in a covered propagator that plugs in. I put the seed tray on a bed of moist sand inside the propagator and they germinated very quickly. I also found that the cosmos from last year seeded around the garden and germinated themselves, although they did so too late to turn into flowering plants. Fabulous plant but i’m trying to save some seeds but so few heads had ripened enough! What about you, Sheila? I grew Cosmos for the first time last year and they were flowering right into November (in East Lothian), with assiduous deadheading on my part. I planted some seeds at the end of February this year (impatient about getting the growing year under way) and I already have some seedlings with their second set of leaves: Purity, which is white, and Dazzler, which is bright pink. The plan is to grow the pink ones beside Crocosmia Lucifer for that delicious red/pink effect. Claire, thanks for that, I’m in east Lothian too and Purity grew so well for me. I’ve delayed seed sowing as we’re away for a week soon…I plan to sow before I go so they can germinate while I’m gone… that’s the plan anyway. If you’d like any spare astrantia Roma let me know, I’ve loads!